Sagar scolds Gangaa that his father was talking so sweetly to her but she kept quiet and angered him all the more. He asks what has happened to her and to atleast tell him and promise to talk to his father on her behalf. She recalls her vow to Amma. Sagar doesn’t let her go until she tells him the truth that she is certainly hiding something and asks if his grandma say anything to her? She shakes her head and he is 100% sure that she is scared so she is quiet. She nods but then shakes her head. He requests her to speak up as she used to tell him everything earlier but now she don’t care and don’t care about him anymore. He adds that he was so concerned for her and he couldn’t sleep the entire night as he was worried about her and he thought she would be hurt and crying but his father is right that she is stubborn and don’t listen to anyone. As he begins to go, she stops him and agrees to tell him through gestures. He is confused and request her to write if she is scared to talk. He realises that she cannot talk. She tries once again through gestures but this time he tries to figure out everything that his grandma has made her take up a vow to keep quiet? He wants to tell it all to his father but she requests him not to do so. He wonders why she doesn’t want him to tell it to anyone and insists they should share it with his father, if not he will become all the more angry if she keep quiet and atleast he can talk to him. He assures her that he will talk to him and not to worry. She makes him take a swear on her. He agrees for her sake but is still not sure why she is doing so. He runs off to tell the same to his mother. Madhvi gets a sprain in her back while tidying the bed. Maharaj is concerned seeing her in pain. She doesn’t let him share it with Niranjan as he is busy in his study and he ( Maharaj ) will have to handle the kitchen work today. He nods. Sagar comes running there to tell his mother everything. He notices her sitting in pain. Amma is seen reading mantras when Gangaa comes running there. She tries to explain the situation to her but Amma cannot understand her gestures. She dismisses her to let her concentrate. Gangaa wonders how to tell Amma as she only made her swear to keep a silent vow and wonder why don’t she ( Amma ) understand and it will be a big problem if Sagar tells the truth to his mother Madhvi. Meanwhile, Gangaa who somehow tells Sagar about the oath she took not to talk is all tensed. She notices Sagar running towards his room. The female maid named Mary tells Maharaj to go to the study room as Niranjan is calling him. He gives the spray to Gangaa to give it to Madhvi. Gangaa is all worked up thinking that Madhvi will tell Niranjan sir everything now and he will get more angry as Sagar got her in trouble. Sagar leaves for Shruti’s house. Pulkit is talking to someone about one particular day where he and his friends had seen a movie together. His friends still tell him to join them that they will go to mall. Pulkit is tempted but scared of his father. His friend talks against it that father lectures everyone all the time and it is nothing and that they are right outside his house. They come requesting him to join them. Madhvi who is in very much pain is having trouble breathing as the pain is unbearable. Gangaa comes there. She tries to help Madhvi but has no idea how to do it. Madhvi who out of the blue gets a severe back pain and she asks Gangaa to call someone as soon as possible but she is unaware that the only problem is Gangaa can't talk due to the vow she took. Madhvi is diagnosed with kidney stone problem but the doctor assures them that the stone is real small and it can be fine with medication and she won't have to get a surgery done. As Madhvi is feeling better now, the doctor gives her special instructions about her diet and adds on thatany patients avoid coming to see a doctor when the pain starts and she ( Madhvi ) too did the same mistake. She should have come here as soon as the pain had started. Niranjan too is confused and says he was at home yet she didn't tell him and asks the reason why?. She tells him that she had told Gangaa to call someone for help and maybe she forgot. Meanwhile, Gangaa is praying as she thinks of Madhv that she loves her so much and if her mother was alive then she too would have done the same. But she love her so much and plead to God not to do anything wrong to her and that she can do anything for her. She keep thinking that if the doctor would not have understand her then she would have even broken her father’s swear too. She wouldn’t have let anything happen to her and plead to God to make her well as soon as possible. Amma is pacing in the house when Prabha and her husband Ratan come there in a rush. Prabha is concerned for Madhvi and she overreacts though. Even Amma is unable to connect to Niranjan and says she is really worried. Just then, Niranjan, Raghav and Madhvi return home. Gangaa is happy to see Madhvi home all safe. She stands behind a pillar to watch them from a distance. NIranjan tells his family members about Madhvi’s condition that it can be treated with medicines and she wont need any operation. Amma is glad that there will be no operation and asks her daughter-in-law if she is alright?. Madhvi nods. Prabha takes Madhvi to her room. Amma confirms with Niranjan that there is nothing to worry. But he speaks about the incident and notices Gangaa standing at a distance. Niranjan takes Gangaa to his study room. Amma follows him tensedly. He questions Gangaa that Madhvi told her to bring someone yet she didn't share it with anyone as she was writing in pain yet you kept quiet and they all were at home and further asks why didn't she tell him?. He then asks if she forget it?. She explains to him through gestures. Amma watches everything and is scared. He still scolds her for being so careless and asks what if Madhvi’s situation had worsened? He scold her further that he cannot believe it that she can do something like this and reminding her that she ( Madhvi ) loves her so much and so do she ( Gangaa). He further remind Gangaa that she had taken Madhvi's side that day when he had blamed Madhvi for the store incident and she didn't like it that he was talking badly to her and Madhvi would not have spoken wrongly to her too as she even argues with him for her. He again asks Gangaa why she is quiet and how can she be like that that she can overlook and just overlook the person who is in terrible pain?. He again asks how did she change so much and for what?. He then says there must be some reason and he is so angry with her as he thought she is a responsible girl and loved her like their own but she proved him wrong again and she don’t care about them at all and further asks if she isn't bothered seeing Madhvi thus?. But Gangaa maintains her silence. She gets up and runs out of the room as she is hurt with Niranjan scolding her wrongly. He shouts after her but Amma tells him not to ruin his health as Madhvi is fine. He still cannot understand how Gangaa could do this and how did she change so much?. Amma again fills his ears against Gangaa that she might have taken his scolding to her heart. He says it is her stubbornness if it’s true and they have done so much for her, so she should study if she wants to be independent in life. Amma nods and clearly says the girl is very stubborn but she is done with her and have decided not to say anything about her. Niranjan finds sense in his mother's words that their love has spoiled her instead and he won't have forgiven Sagar or Pulkit if either of them would have done so. He adds on that Amma only can take care of her and agreed that they share no relation with her but now that they have taken up this responsibility then they will do it. He asks his mother if she will handle her?. Amma agrees that she will do it but in her own style and he cannot interrupt her in between. Niranjan gives his mother ( Amma) full freedom that they will have to be a little strict with Gangaa too. Amma takes charge of teaching discipline to Gangaa but he will have to trust her though and he cannot question her every now and then. He nods. She promises to do so soon. He gets a call and goes outside to attend it. Amma smiles thinking of how her plan worked in her favour. Prabha and her husband put Madhvi in her bed. Madhvi tells them to go home as Yash must be waiting. They tells Madhvi that Yash has gone to his tuition and assurring her that they will go to pick him directly from here when it's time. Prabha suggests coming to Madhvi's house every day to look after Madhvi but her husband Ratan tells her against it that his sister Madhvi will get busy in taking care of her then. Prabha talks about what happened and asks why didn't she tell anyone that she is in so much pain?. Madhvi takes Gangaa’s name. Prabha gets angry and asks what the girl is trying to do?. But Madhvi takes Gangaa’s side but Prabha talks against Gangaa that she is not at all responsible that is why she kept quiet seeing her thus and asks what if something had happened to her?. An helpless Gangaa is sitting sadly in a corner and talk to herself that she really care for her Madhvi Ma and she would have been hurt the most if anything had happened to her. She tried telling everyone about her condition but no one could understand her, neither Pulkit nor Amma nor Niranjan sir and she couldn’t talk as she had sworn in her father’s name and she was feeling very bad seeing Madhvi Ma writhing in pain. Niranjan and Amma notice her thus. Amma makes her son Niranjan tell Gangaa what they have decided. Amma calls out for Gangaa. She looks at them and gets up. Niranjan tells her that they have decided to let Amma look after her from today onwards and she will do whatever she asks her to do. Adding that she will not give anyone a chance to complain this time and if she love or care for them even a little bit. He leaves. Amma who didn't feel remorse with her action sits down on the bed. She tells Gangaa that Niranjan is angry right now but he will be fine in a day or two and he will start talking to her again soon and she is there for that, and asks Gangaa not to worry as Gangaa got what she wanted since she don’t have to study anymore. But she will have to do what Niranjan has told her to do and Gangaa will have to listen to her if she want her Niranjan sir to start talking lovingly to her again and she ( Gangaa) don’t have to tell anyone about her silent vow. Gangaa nods tearfully. She is still quiet so Amma finally tells her that her silent vow is over now. On hearing this, Gangaa starts crying. Amma is confused and says she can talk now and asks why she is crying?. Gangaa shares that Sagar knows the truth and he had said that he will tell his mother about this. Amma is taken aback by this. On the other hand, Sagar comes to see his mother and asks what happened to her?. Madhvi assures him that she is fine. Prabha again talks against Gangaa. She tells him what had happened that Gangaa didn't tell anyone anything and she was all quiet. Sagar recalls Gangaa telling her the truth. He turns to Madhvi and her her that he want to tell her something about Gangaa. Just then, Gangaa comes rushing there. She apologizes to Madhvi that she made a very big mistake. Sagar denies that she is not telling her ( Madhvi) the entire truth and offer to tell his mother everything. At the same time, Amma comes in to tell them that Ganga is young and she made a mistake. She forgot about her ( Madhvi ) condition and prayed nonstop when she was taken to the hospital. Amma adds that Gangaa is arrogant and stubborn but loves her ( Madhvi ) a lot. Amma who interrupts Sagar says Gangaa is naughty but she loves her (Madhvi) a lot. Madhvi too knows that Gangaa loves her a lot and tells her son that it’s okay and not to be tensed about anything. Sagar again tries to say something but Amma stops him. Niranjan too tells him not to trouble his mother. Amma takes him out. Prabha and her husband too leave. Gangaa is still standing near the door. Sagar pulls her outside that she had decided to keep quiet so how can she talk now?. Gangaa tells him that her silent vow is over. Sagar wonders why she didn't let him tell anything to his parents as his father is upset with her. He asks Gangaa if she like it when someone scolds her? 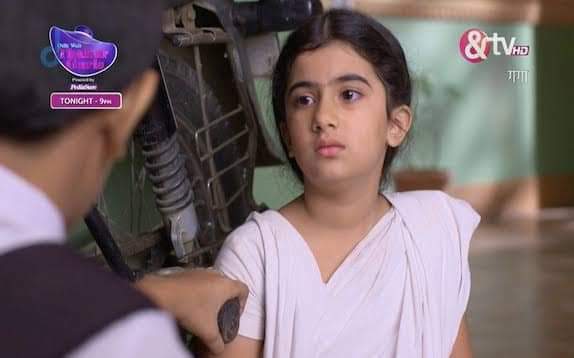 Gangaa says she cannot tell as Niranjan sir had told her to listen to everything that Amma says from today onwards and Amma had made her swear in her father's name and she is not supposed to tell anything to anyone. Gangaa adds that she anyways made a mistake by sharing it with him and plead with Sagar not to share it with anyone else as Amma has said that everything will be fine if she listen to her and that the teacher won't scold her and Niranjan sir too will calm down. She further asks Sagar if he don't want his father to talk normally to her again?. On hearing this, Sagar leaves from there upset. Prabha sends her husband outside to start the scooter so she can seek some inside info from Gangaa and further asks how come she is supporting Gangaa suddenly?. Amma talks well about Gangaa that she is a kid. She needs both love and scolding and she will learn in time. Amma adds that Gangaa has started following her every word. Prabha nods and says she have understand everything. Maharaj brings white cloth as Amma had requested for it. Prabha is curious about the cloth but Amma dismisses her questions. Prabha leaves. Amma calls someone that she had called some stuff for her at home and she can come and take it right away. She asks the maid about the teacher and the maid tells her that he is already waiting for her in her room. Tiwari meanwhile is sweating as he paces in Amma’s room. He gets tensed seeing so many photos of Gods in the room. He folds his hands before the photos and then sits down on the bed worriedly. Just then, Amma comes there and tells him that she knows that he is hurt by Gangaa’s behaviour. He says he have been teaching since so long but no one has behaved this badly with him ever. Amma hits him on his self respect point that he put it on stake for he must be needing money and he came back to their house after taking that insult. He nods. She tells him to follow what she says if he wants to continue working in the house. She calls out for the maid ( Mary) and Maharaj to send Gangaa in her room. Niranjan is seen massaging Madhvi’s head. He is very concerned about her health and says he can postpone the date of the court if she is not feeling well and it is okay if he don’t go today. Madhvi is happy that he cares so much for her. He tells Madhvi that he knows that he is not able to show that he cares but he does care and asks what if something would have happened to her today?. She shakes her head. He further tells her that he was all scared to see her writhing in pain and he didn't feel normal till he saw that little smile of hers. He was scared that he may lose her as she had to bear so much pain just because of one person’s carelessness and it wouldn’t have aggravated if they would have found out on time. She tells him not to be so angry and asks if he would have been equally angry if Sagar or Pulkit had made this mistake?. He says he is sure he might have slapped them but he is still lenient with Gangaa as he know he don’t have that much right on her. He have understand Amma's logic now that one has to be a little strict with kids too and he have given her Gangaa’s responsibility. He tells Madhvi that she too should not say anything to her as Amma will handle it. Madhvi is worried as Amma is really strict. But Niranjan is sure Amma will do the right thing. That same day, Sudha and Pishi Ma come to meet Amma. Sudha wants to know why she called them suddenly. Amma had given them such a big amount of cash a few days back. Amma acts all great. She gives them a very big yarn of soft white cloth so the widows from the ashram can get their clothes stitched. Pishi Ma is happy that it will be a lot for them for approximately a year. Sudha knows that Amma has called them here for some other reason and this was just an excuse and she could have made Maharaj drop it to the ashram. Amma tells Sudha that she have become really smart and takes them to her room.